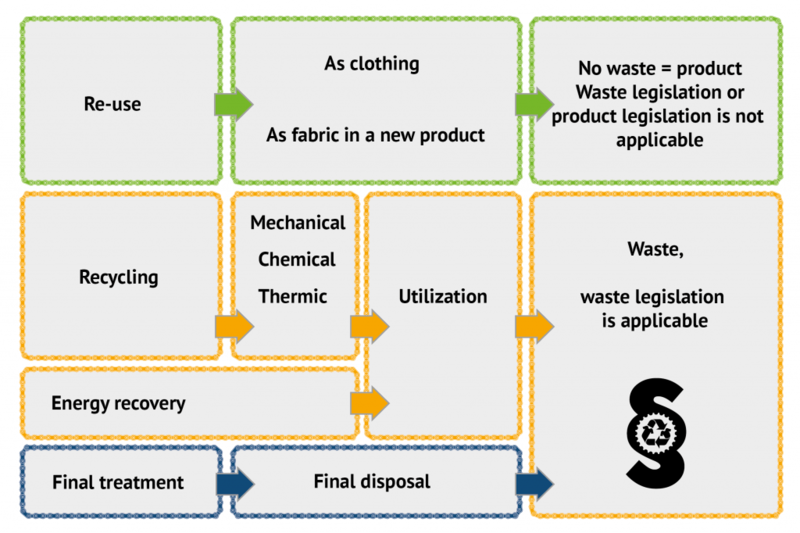 End-of-life textiles are textiles that have become redundant for the holder and it includes both textile waste as well as textile products, meaning used and wearable textiles. Textile products can still fill their original intended use. Unsorted end-of-life textiles are considered waste. Reuse means utilizing an used product or parts of it in its intended purpose. Recycling is an activity where waste is reprocessed into a product or raw material for its original or another purpose. Reusable textiles should primarily be donated to charity, sold at a flea market or exchanged amongst acquaintances. If a piece of clothing doesn’t fulfill the requirements for reuse, it is considered textile waste and should be discarded according to the guidelines of the local waste management company. Waste management follows the waste hierarchy, which states that waste generation should be prevented and any generated wastes be directed towards reuse. If this isn’t possible, waste is recycled as material or secondarily used for energy recovery. Sometimes it is possible to deviate from the waste hierarchy on the basis of environmental impact assessment. One goal for the Telaketju project is to clarify the legislation related to end-of-life textiles. 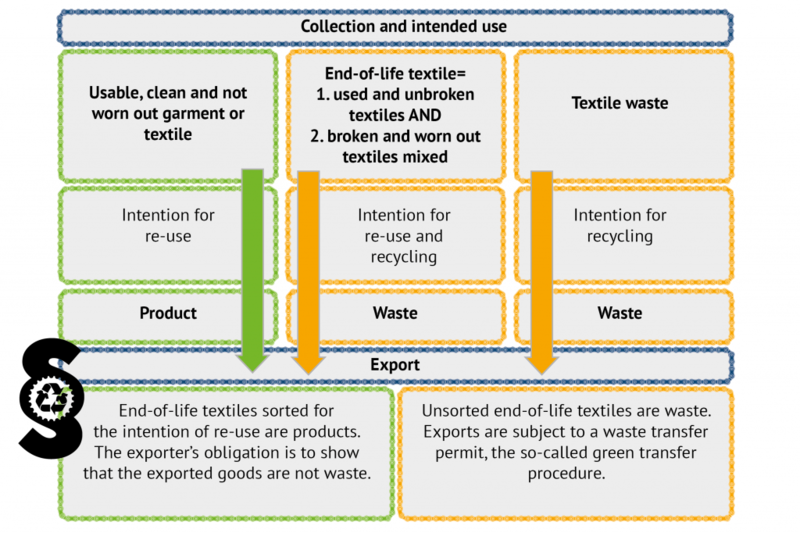 A code of conduct for the end-of-life textile field was created in cooperation with the Finnish Environment Institute. The below picture summarizes the directives on the collection and exportation of different textiles. A comprehensive report by Hanna Salmenperä is available for download from the link below (in Finnish). Municipality is responsible for household textile waste, municipal waste from public activities, as well as municipal waste from private social and health services and educational institutions. Any holder of waste is responsible for textile waste equivalent to residential waste when it originates from private actions such as trade, services and industry.